FICTION: Maggie is the Half-Irish Harlot who seduced her best friend’s husband on the eve of their wedding. She is to be feared and loathed as she will lift her skirts for anything in breeches. Still crushed by Simon’s betrayal, Maggie has no intention of letting the ton crush her as well. In fact, Lemarc’s cartoons have made Simon a laughingstock…but now it appears that Maggie may have been wrong about what happened years ago, and that Simon has been secretly yearning for her since…forever. Could it be that the heart is mightier than the pen and the sword after all? “Good evening, Lady Hawkins.” He quickly made the introductions and, despite her apparent displeasure at Simon’s presence, Maggie fussed over the legendary Duke and Duchess of Colton. “He is well aware of that fact. I taught him never to underestimate a woman.” Julia raised her brows at Colton as if daring him to contradict her. “Quite true, Duchess,” the duke responded with a smirk. The uniqueness of her beauty struck him, as it always had. Pitch-colored, glossy hair. Creamy skin without a blemish or mark. Full, pink lips. There was no woman on earth like Maggie. He’d known it the first time he clapped eyes on her—as had any number of other men, if the rumors of her numerous affaires were true. “The duchess was correct. You are quite beautiful this evening.” His tone was sharper than it ought to be when paying a compliment, and he nearly winced. Her look turned measuring. “Thank you, though I might catch my death if I do not change out of my wet clothes.” She picked up the skirts of her dress, showed him the soaked fabric. Instantly, he was transfixed by the vision of her shapely leg covered in damp, transparent silk. His blood began to simmer. He wanted to feel her, to hold her . . . to run his tongue over the smooth knob of her ankle. A monumental mistake, if he allowed it, though desire was hardly ever logical. “Oh, the horror,” Simon drawled. Links to Joanna’s website, blog, books, etc. 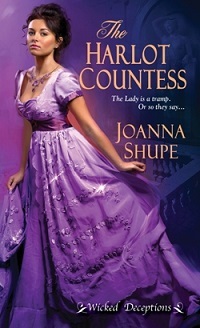 Thank you so much for hosting THE HARLOT COUNTESS today!